This may just be my favorite outfit I’ve ever posted on this blog. The ethereal off-the-shoulder dress (also available here and here), the pops of pink, the fringe mules! It really all comes back to the dress though. I’m head over heels obsessed with it! It’s everything I’ve ever wanted out of a little white dress: flattering, feminine and effortlessly chic. If you’ve been following along for awhile, you’ll know that Tibi is one of my favorite designers. I’m always featuring Amy Smilovic’s chic separates and pretty dresses on THE EDIT, and own many a piece from her collections over the years. So, when Tibi reached out to see if I would host an event for them at Stanley Korshak this Thursday in Dallas, I totally geeked out. It’s “pinch me” moments like this that really make all the hard work and time I’ve put into this blog, worth it. So here are the details… This fabulous event is from 5-7pm in The Shak at Stanley Korshak, this Thursday, April 2nd! If you love Tibi as much as I do, you MUST come by! Shop the latest arrivals from Tibi’s spring/summer collection and receive style suggestions from me. I’ve included the event invite below for you to view – if you are able to stop by, please be sure to RSVP by emailing RSVP@StanleyKorshak.com! Can’t wait to see you all there! That dress is AMAZING, you look gorgeous! Love the dress and those mules are perfect! Love the shoot location and those earrings are such a gorgeous pop! You are killing it! I love everything about this look on you! Total perfection! yep, that dress is a masterpiece. You look stunning and those blossoms on that tree are breathtaking. So so pretty Merritt! That dress is so beautiful! I have yet to see that Tibi dress, but I love it! Serious babe alert – you look AMAZING, Merritt! Seriously one of my all time favorites of yours! The dress, heels, earrings… everything is so good. Congrats on the event I’m sure it’ll be a blast! love the turquoise accent in the earrings! How funny…as I was looking at these incredible pics I said to myself…”wow this is by far my favorite of all her looks” and then I scroll down to read your post and it’s the first comment you write! The colors with your hair and skin are just perfect and I love the softness of it all even with bold colors like turquoise and red. It’s is just so good! Absolutely stunning! This needs to be on constant repeat in your wardrobe this season as it’s a total winner! Definitely one of your nicest shoots, Merritt! The spring background is the perfect touch! This is such a gorgeous look! Absolutely love how you styled this dress! This is such a sweet and romantic look! 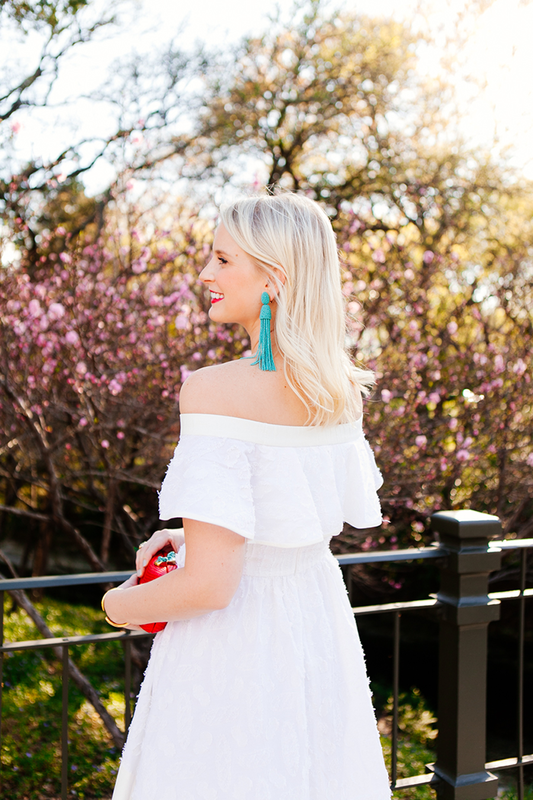 I love the frilly sleeves, and how you’ve accented pops of turquoise and poppy. What a pretty dress on you! And stunning earrings! Gorgeous. I love that lipstick!!! I also love anything with fringe so those shoes are a win! This dress is beautiful on you. Those earrings are stunning. this may be my favorite outfit of yours also – its absolutely perfect. Ive wanted those earrings and clutch foreverrrr and that dress is just to DIE for. I’m in love. Where is that ring from!? Red lipstick more often! Love it. I need this whole outfit in my closet, STAT! The dress is simply amazing. Gorgeous!! 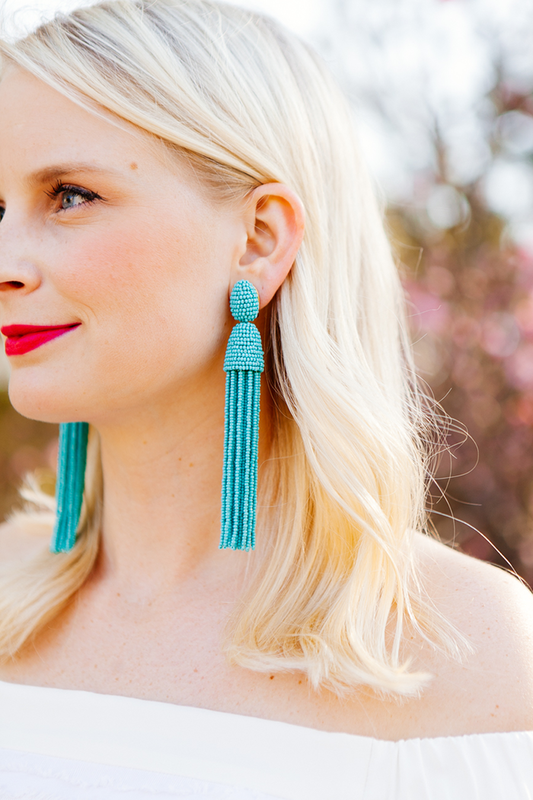 LOVE those turquoise tassle earrings!! They compliment this crisp, white dress perfectly! You look so pretty and I love how you paired your dress with these turquoise accessories! I have been loving all the off the shoulder styles this season and this dress is one of my favorites! Stunning! I am obsessed with this. The shoes, the earrings, all of it. You look beautiful. there is so much awesome in this photo, from the dress, to the location, to the flowers and the overall spring feel. This is such a good post. Those wedges are amazing!!! You styled them perfectly, too! This is definitely one of your best looks! That dress is gorgeous, and those shoes are amazing! I think those earrings are more fabulous then the dress! Beautiful look! Love the pop of colors in your accessories and the red lipstick!